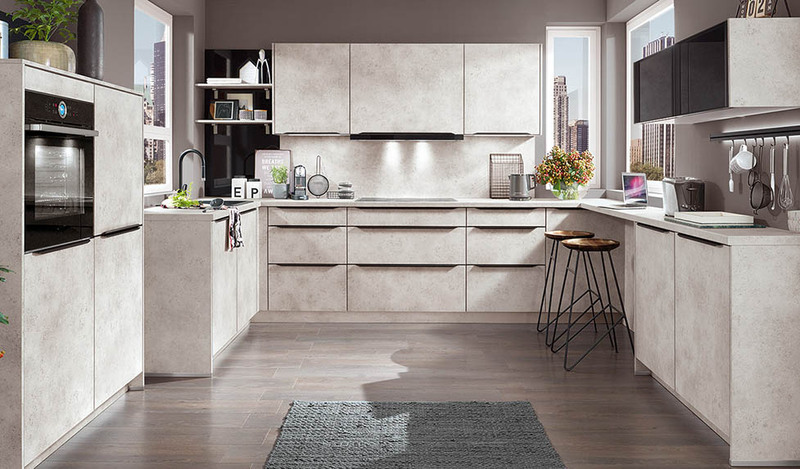 Nobilia Speed 281 Ceramic Grey is a quality German made kitchen available from iHome Interiors that offers a very different door finish to the normal german kitchens on offer today. In recent years, urban and industrial tones like copper, bronze, concrete and here ‘ceramic’ have become very popular, either on their own or paired with natural wood textures or the traditional high gloss finishes. 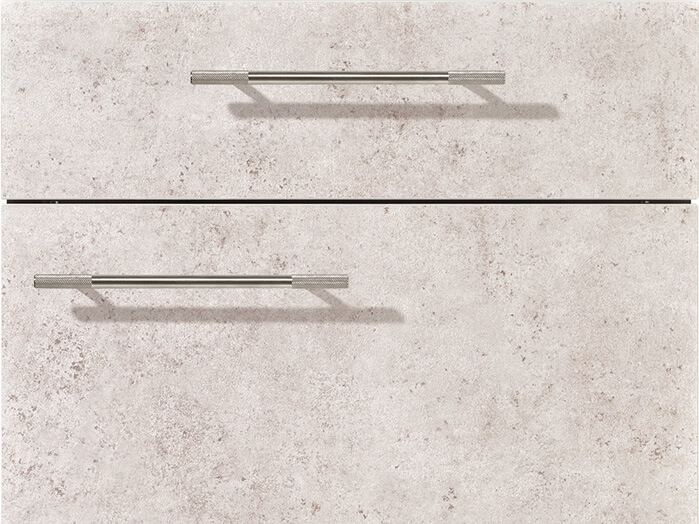 As you can see from the door front image (left), the Nobilia Ceramic Grey reproduction is textured and has a finish that is reminiscent of stone or polished concrete. The design shown above is an atypical U-shape with a small overall footprint and ideal for small houses and apartments. Short distances, smart work sequences and cleverly structured storage space are the most important aspects of kitchen planning and where space is at a premium kitchens with a U-shape layout are often a good solution. The small breakfast bar (and stools) to the right offer informal dinning or a place to work with the cooking zone occupied by the centre hob and single oven to the left of the kitchen, which optimises space and retains some openness, even with such a small floorspace. 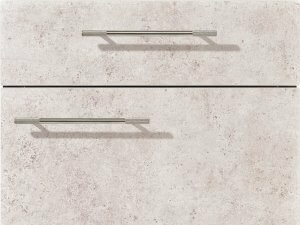 Nobilia German kitchen furniture is renowned for its versatility and the beauty of this is that if you tire of the Speed Ceramic grey in a few years, why not simply switch out the doors for one of the many other colour choices from the Nobilia Speed range? Nobilia Speed is also available in White Softmatt (239), Alpine White (244), Ivory Softmatt (206), Satin Grey (259), Montana Pine (260), Virginia Oak (262) and Sand (271). iHome Kitchens & Interiors design and install a stunning range of English Made and German made Nobilia kitchens across London and the Home Counties such as Buckinghamshire, Berkshire, Surrey, Oxfordshire, Hampshire and Hertfordshire. To find out more, ask our Design Team some questions, to order a brochure, or to request a FREE DESIGN VISIT please feel free to contact us at your convenience. 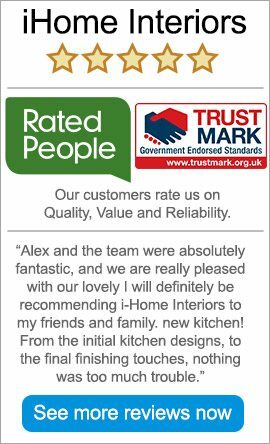 Be sure to have a look through the vast number of kitchen projects and installations we designed to date pin our Portfolio.